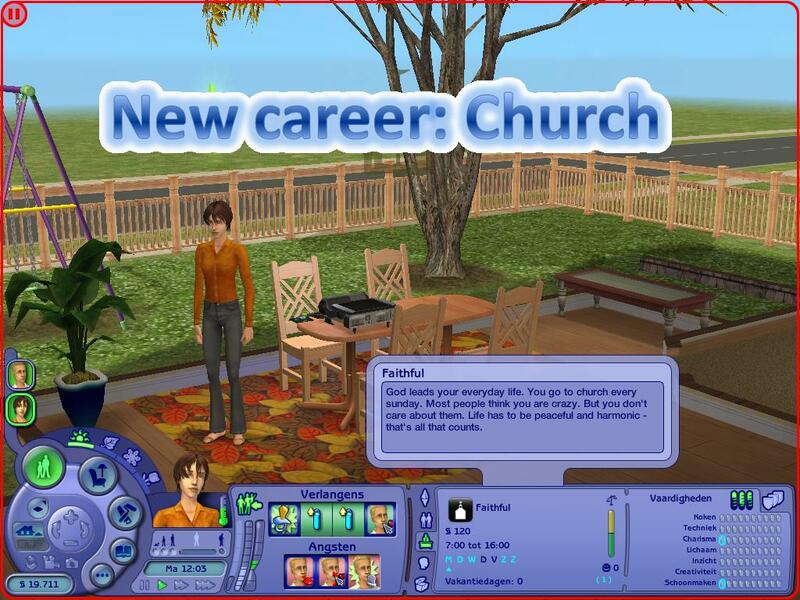 As I do take requests, Nini20 requested the career Church. Description God leads your everyday life. You go to church every sunday. Most people think you are crazy. But you don't care about them. Life has to be peaceful and harmonic - that's all that counts. Description Now you can get involved with all the things you care about. You work in the neighbouring church and you can help the pastor with small things like assisting at the church service. Your life is more precious now. Everything is divine. Description Got it. You're in. You can preach. You can shrive. Your dream came true. You knew that you were born to serve God. Now you do. Description Let everyone know the power of the Allmighty. You are on the roam to convince all the unfaithful to convert. So you can show everyone which faith you have in God yourself. You praise God on every bar table in the neigbourhood and collect as many converters and as much money as possible. Description What an advancement. The top Church Men have discovered your talent. Now you can do Church Services again. The people listen to you and respect your standing. That is a life you ever dreamt of. Description Now you can decide who will become a priest. Now you can decide what is important for the Church. You love your sheep. And they love you. Description The way is getting shorter. You long to come to the end of the big stairway. Your power is nearly endless. You feel already close to heaven. Description Power. Wealth. Money. Respect. And... well, Faith of course. Description The last step. There is only a little work to do. It's a great feeling to be respected that way. You love your job. Description You are on top. You are the leader of all Faithful. You have the power to lead all church aspects. You solve all the problems. The people celebrate you like you were God himself. What could be better than that?